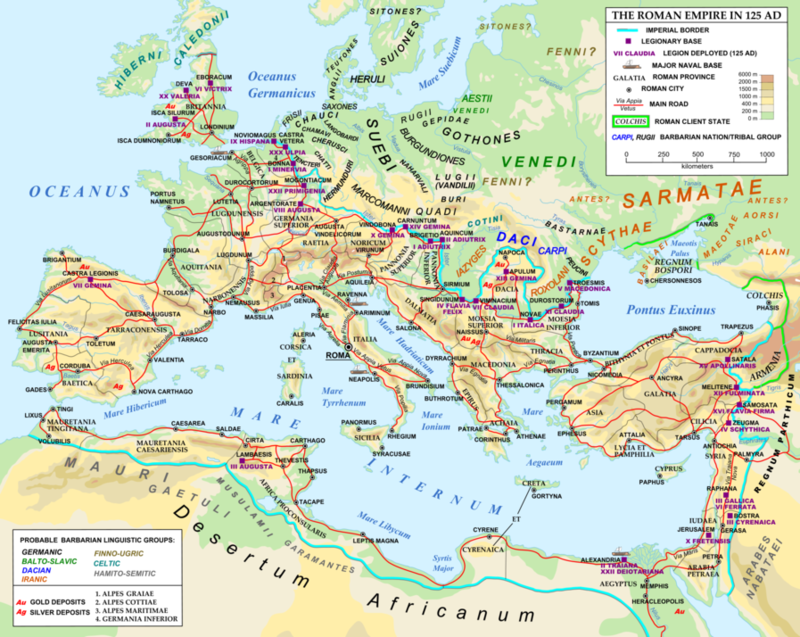 Romans began as a monarchy around 800 BC and began growing north of the Tiber in the 6th century BC (Berechyam, 2002). After a line of kings, Rome turned to a Republic in 509 BC. Rome’s location along the river made it in an opportune location for trade and commerce. As centuries passed, Rome’s power grew over Italy. 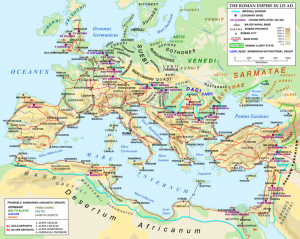 This subsequently was when Rome began building its network of roads to move its armies. The success of which was seen in the coming years of war. The first Punic War (264-241 BC) marked when Rome expanded beyond the Italian peninsula and took Sicily; in the Second Punic War (218-201 BC), Rome took Spain and the land surrounding the Mediterranean; and in the Third Punic War (149-146 BC), ‍Rome beat Cart‍hage (Berechyam, 2002). 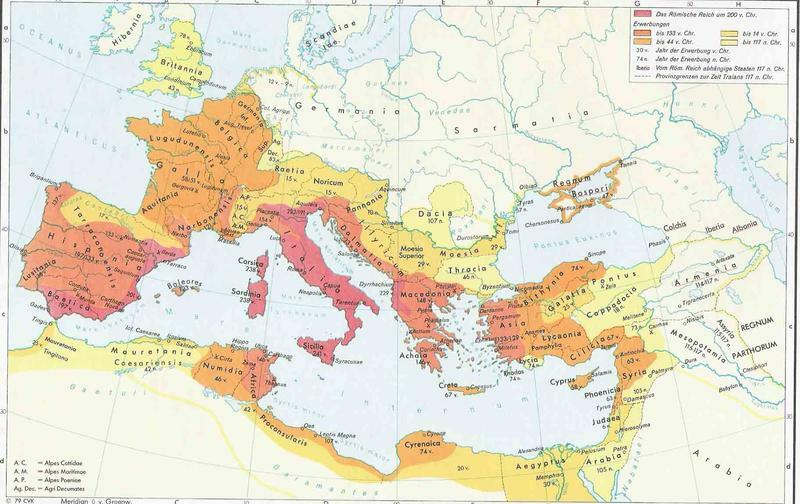 Although the Roman Republic had its fair share of challenges up until this point, social and political unrest became extremely prominent in the last century of the republic. Rome continued to expand, but at this point it was more under threat of its own internal instability than external powers. During this time, Julius Caesar conquered Rome and turned it into a dictatorship from 47-44 BC. After his assassination, Rome struggle to return to a Republic. Octavian (later Augustus) defeated what remained of the the Republic’s power and became the first Emperor of Rome. As Rome settled into becoming an Empire, it’s power did not falter and instead continued to thrive. In fact, war became essential in fueling the Roman economy. Figure 2 above illustrates the expansion of the empire from these series of conquests. Once Rome became and empire, roads were no longer the responsibility of landowners or in need of special contracts (Berechyam, 2002). Instead, the wartime economy gave reason for better and more expensive roads to be built. Roads ran all over the Roman empire, but some of the most influential roads lead to Rome itself. Or historically, from Rome. Roman roads were initially purposed for the more efficient movement of armies. At this time, these armies consisted primarily of legions of foot soldiers, marching from Rome in hopes of expanding the empire. Strategically planned and well built roads allowed these armies to move with little hindrance, making Rome all the more effective in its conquests. Similarly, as the empire grew, these roads allowed armies to move from one end of the empire to the other and preserve the empire from external threats. Acting as a hub of the Empire, many of the significant roads branched out from the city like spokes from a wheel hub; such an image can be seen in Figure 3. Thus, not only was Rome a thriving metropolis by itself, but it also was a central power that reached its influence across the empire. How these roads were planned and laid out also influenced their effectiveness. Romans paved straight segments of road between where the road started and its ultimate destination. This method avoided long distance travel, particularly for Roman armies, from relying on navigating short roads between nearby locations. Instead, roads were designed to have arrow straight segments with a handful of abrupt turns put in when necessary to avoid natural obstacles or human settlements (Berechyman, 2002). This method lead to a more highway-like road system with a straight road connecting two major destinations and smaller roads extending outwards to reach locations the road passed but did not connect with (Oleson, 2008). Similar characteristics can be found in today’s interstate system. Even the initial purpose behind some modern day road systems reflect Rome’s military use of these thoroughfares. One such modern system is the U.S. Interstate System, resulting from President Dwight D. Eisenhower’s Federal-Aid Highway Act of 1956. Although not the sole or main purpose of this interstate system, one influencing factor in wanting a more advanced national road system was national security and defense against the possible atomic war (Weingroff 2013). The initial military purpose of these road systems is also important to note since building such a efficient and direct road system was far more expensive than smaller and less direct routes (Berechyman, 2002). Wartime economy took on the expense of the surveyors, markers, builders, and more resilient materials. The better the roads, the faster the armies could move, the more the armies could conquer, and the more successful the empire became. If these roads initial purpose instead was for movement of commerce, these additional costs likely would not have been seen as much of a necessity. Thus, the ability for communication and goods to also travel efficiently across the empire once these roads were built was more of a positive side effect than a serious consideration in the initial construction of the roads. However, even though the roads were not initially intended for such uses, once the armies had completed their conquests, roads were crucial in uniting the lands that had been absorbed into the empire. 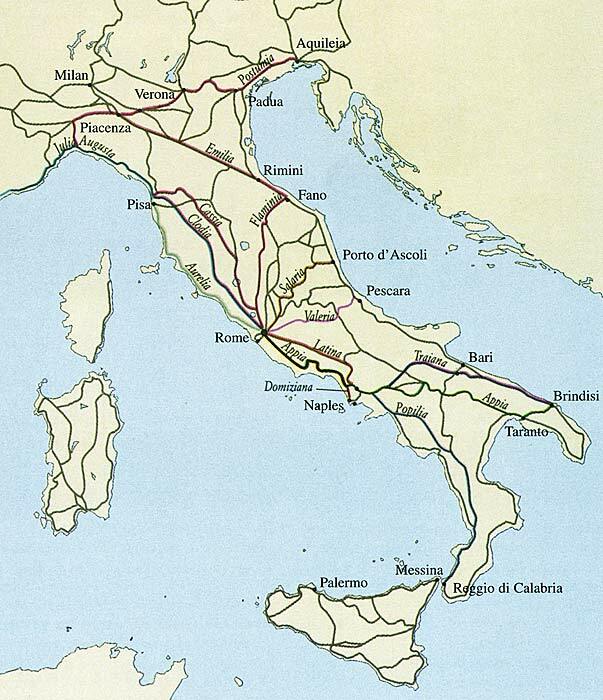 Although roads were key in the expansion and connection of the Roman Empire, they were not always the fastest or most convenient mode of transportation. In regards to the transport of goods especially, land transportation had only a fraction of the load capacity and had significantly longer travel times than ships and river boats. However, roads had access to the entire empire and were not as limited when compared to sea and river transport. When ships and boats could only access port cities or those on rivers, roads could reach every corner of the empire. Not only that, but roads were also far less reliant on weather conditions. Aside from the construction efforts it took to survey and lay out the straight roads, Romans also included additional features in their roads. ‍Sewers, ditches, drainage canals, and other environmental and weather related additions were included when necessary in road construction to create a functional, direct, and long lasting road systems‍ (Oleson, 2008). ‍The Roman’s could construct their ships to try to bear rough waters, but when it came right down to it, when the weather was bad there was not much to do besides stay in port. Even so, Roman’s heavy use of legions of foot soldiers is evidence that Romans tended to favor land based thoroughfares. Roads had much more flexibility in how transportation could be easier even when the weather turned sour. Romans could both build their vehicles to better withstand weather troubles and construct their roads with weather impediments in mind. Embankments, runoff gradients, using waterproof materials, and roadside shelters were all options in making traveling easier in bad weather. In the last few years, scholars have teamed up to create an online model of the Roman transportation network called ORBIS. This website maps all of the possible routes within the empire at it’s peak, allowing an individual to gather travel information on a specific route between any two cities in the Empire. 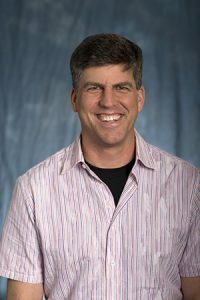 Additional circumstances can also be defined such as season, medium of transportation, willingness to transfer between modes of transportation, and vehicle type to gather more accurate calculations. This map also helps point out how unlike water transport’s complete inability to reach some parts of the empire, roads span its entirety; water transport in some cases is used not because roads could not be, but because a route across water was shorter, faster, and ships could carry heavier loads. 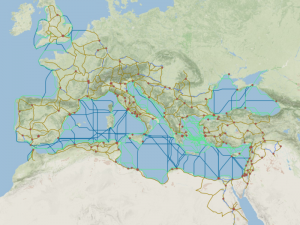 Thus, Romans took advantage of sea and river travel when practical, but tended to rely more heavily on roadways. This resource makes the pros and cons of each type of travel between two locations evident. Being able to define season, mode of transportation, vehicle or non vehicle operations on roads, and importance of speed, cost, and length for the journey, travel options can easily be compared. This way, it can be evaluated when land, water, or a combination of both modes of transportation would be ideal depending on origin and destination locations. 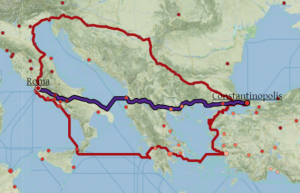 In the case of traveling between Rome and Constantinople, two of the most important cities in the Roman empire, roads might not be the best choice when deciding how to travel. Although the road route is shorter than its primarily sea crossing counterpart with only 2170 kilometers to cross instead of 2724 kilometers, it takes over three times as long to complete the journey at 73 days versus 21.3 days. 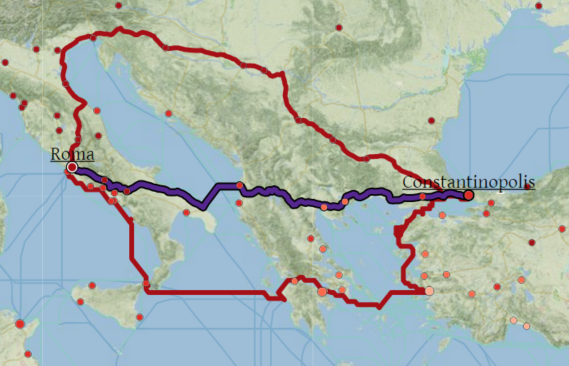 However, despite the sea route being what appears to be the most opportune route when considering speed and cost, trumping even the shortest route which takes almost 52 days to complete, it still relies on using roads to cross modern day Greece. When roads can reach any two destinations (aside from islands), the far more efficient and load bearing sea transport options still often rely on roads to complete their routes. Which, like in this example, can even be true for travel between two port cities. Before roads could be constructed, their path had to be decided. This step alone was one of the more impressive accomplishments involving Roman roads for it required accurate surveying. In order to create such straight roads, land surveyors were sent out to determine the best and most direct route for the road to follow. These land surveyors, most commonly known as gromatici or agrimensores, included citizens, freedmen, and slaves (De Nardis, 2000). 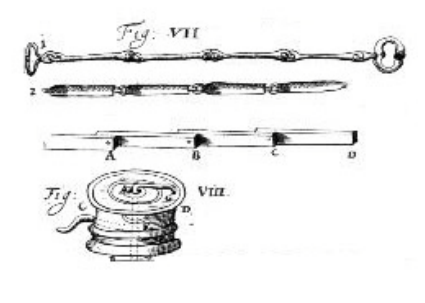 These surveyors used a wide variety of tools, some of which are shown below. 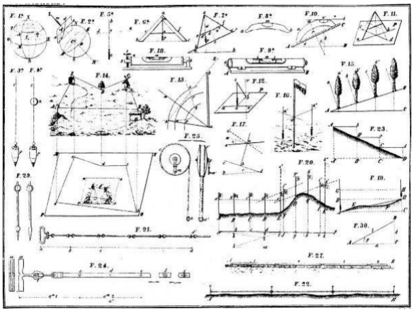 These included string, chains, odometers, range poles, a surveyor’s square, gnomon (to measure Earth movement), leverers, diopters, and groma‍ (a type of surveyor’s square) (Gallo, 2004). Each of these instruments provided their own purpose, but they allowed surveyors to determine location, angles, flatness, orientation, distances, and so on. 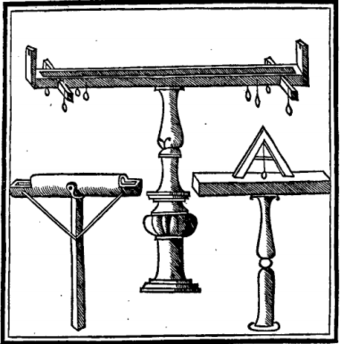 The most commonly used tools being poles and groma. The groma would be used to determine right angles and the pole could then establish a straight line based on the angles given by the groma. Typically, surveyors would use high points along where the prospective road was to be placed for better sighting. Once surveyed, the stretch along which the road was to be constructed was marked periodically on the ground. enforced Roman standards for how roads were to be built. The only description from that time on ‍road construction was in the form of a poem‍. And the Law of Twelve Tables, the foundation of Roman law which initially drafted in 5th century BC, merely stated that a road must be at least eight feet wide on a straight section and at least 16 feet wide on a curved section. It is possible this lack of uniformity could be due to the wide variety of environments and available materials in different parts of the empire. Then again, this might not be the case since it has been observed that different sections of the same road will have been constructed with inconsistent techniques and materials (White, 1984). Despite this, there were several characteristics that are consistent across most Roman roads for they were needed to fulfill the purpose of the roads. Roads, especially main routes between cities, had to be able to withstand the weights of entire legions of marching men, wagons, and two wheeled carts. Additionally, they had to be wide enough for two wagons moving in opposite directions to pass each other. At times roads were wider than this to allow for vehicles to pause along the roadside or when expecting particularly heavy traffic along a certain section. Aside from these core characteristics, roads varied greatly in construction methods, widths, even materials used. Roads built in the 4th century purposed for long distances or high volume usage, including the great ‍Via Appia‍, typically ranged from 4.1 to 4.2 meters wide. Some roads, including the Via Cassia, Via Nomentana, Via Tiburtina, and Via Latina, where either wholly or partially built with a width of 3.8-3.9 meters (Oleson, 2008). Other sources say that roads were built up to 13 meters wide with additional 6 meter wide walkways on either side of the roadway (Knapton, 1996). Or when evaluating roads near Rome itself, roads ranged from 3.5 to 7.5 meters wide (White, 1984). Merely from these few claims alone, it becomes clear that road widths almost never seemed consistent from one road to the next. During this Etruscan period, roads were primarily compressed dirt or gravel laid on top of a basic foundation. 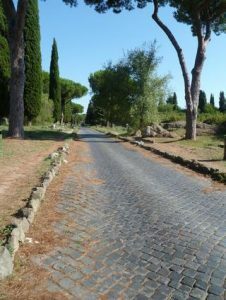 Later roads, including small portions of the Appia Antica, demonstrated a need for a sturdier foundation when flint stones began being used for paving (White 1984). This gravel-like paving was later replaced with the basalt stone slabs that can still be seen today in some sections of the road. This is predicted to have started around the 3rd century BC. Even later still, limestone blocks were used instead of basalt slabs (Oleson, 2008). Cements, particularly lime-cement, started being used closer to the end of the Roman Republic. Often used for foundations and grouting, the lime mortar had quite a few benefits. One of the most important of these benefits being that it made roads waterproof, a significant improvement to transportation. With waterproof roads, the material making the roads were no longer liable to being washed away from rains and they could be constructed to allow for water runoff during heavy rains. Further, roads would be less likely to be worn down by repetitive use and wheels would no longer sink into the surface of the roads and get stuck. The ratios in which lime-cement was used were also not consistent. This is due to the Romans acknowledging that materials from varying locations behave differently (Knapton, 1996). Some examples of ratios between cement, fine aggregates, and coarse aggregates can be seen below in Figure 13. Since these roads were constructed for military use, some of the construction methods adopted military techniques. This can be seen in even the most preliminary steps of road construction. After the road path had been set, the first steps of construction involved making cuts to allow for a flat roadbed and creating embankments. Two ditches were dug out where the sides of the road would be, and retaining walls were put in place. These cuts followed the style of military trenches, with straight sides and a combination of cement and large rocks to hold up the embankment walls (White, 1984). The depth of these ditches were largely dependent on the circumstances under which the road was being built. In part, depth relied on how difficult it was to cut into the terrain of the area and how deep the cut needed to be made before solid enough material was found on which to build the foundation; but another consideration was whether or not these ditches were needed for protection against attackers or aggressive wildlife (Knapton, 1996). After all, many of these roads were built for the army and in some cases, by the army. Roads were constantly being built on the edges of the empire as the military pushed to expand, and a road that could initially be used for protection and later be used for transportation of troops, commerce, and communication was all the more effective. Another use for having these trenches being the first step of road construction was drainage. Although it wasn’t typically a major consideration, in swampy or flooded areas these ditches allowed water to flow out of where the road was to be constructed so that workers could build on a dry and solid foundation (Knapton, 1996), (Berechyam, 2002). Once gutters and ditches on either side of where the road was to be built were put in place, the space between the roadside ditches was excavated. This way the ditches, often dug down until a solid foundation material was reached, marked how deep the excavation had to be. For the rarer circumstance of not finding firm enough material on which to build, wooden planks were on occasion used to create a solid framework (White, 1984). In some cases, particularly on the British Isles, excavation was not included. Instead, these roads were built on top of the existing terrain (Knapton, 1996). Most roads, however, were excavated first such that their final surface was flush with the existing grade. After the construction site had been excavated, the soil was pressed down and either sand or gravel was added. This first layer was often about a meter thick and was material either directly found on site, or was brought from nearby areas (Berechyam, 2002). It’s purpose was to smooth out the excavated bed and create a flat and firm bed from which to add the next layers. Once the ground was leveled and compacted, a layer of lime mortar was added known as pavimentum. In the cases where lime mortar was not used, sand was used instead. This layer was several inches thick; for the Via Appia Antica, it was measured to be 7.6 centimeters (3 inches) thick (Berrechyam, 2002). This layer further created a solid and smooth foundation for the rest of the roadbed. Next, stone slabs were laid down and often cemented together using lime mortar or sometimes clay. This layer was referred to as statumen, was about 5 inches thick, and rested between 10 inches and 2 feet below grade (Hucker, 2009). Unlike previous layers which could be completed by common laborers, this layer involved stonecutters to cut and place the stone slabs (Berechyam, 2002). Following this foundation layer was rudus, or base layer ranging from 9 to 12 inches thick (Hucker, 2009). This was a layer of lime mortar, clay, or sand that was then filled with gravel and crushed rocks to create a concrete like material. A second base layer, the nucleus, was then laid down. Coarse gravel and sand would be mixed with quicklime and poured down in layers. Each layer would be compacted with rollers before the next layer was poured. This layer was also purposefully poured in a crown, measuring 18 inches thick at the center and 1 foot thick at the road edge to allow water runoff (Hucker, 2009). The final layer was a collection of large volcanic basalt stones organized on top of the previous base layer. Aside from the road itself, most Roman roads included elements to make travel easier. These included gutters, sidewalks, and stone curbs between the sidewalks and roadways. Gutters were often installed early in road construction to maintain this drainage of the road even after construction was completed. By doing so, the roads remained easy to travel on even in the rainiest of seasons. Gutters were dug out usually 40 feet apart and ran parallel to the roadside (Berechyam, 2002). Footpaths running parallel to the paved road on each side were also common. These were called margines or iter depending on the type of roadway it was built along (Knapton, 1996). Usually measuring between a little over a meter to three meters wide, these sidewalks were typically compacted gravel and allowed people to travel on foot even when wagons or troops were using the road itself (Oleson, 2008). Between the sidewalks and the roads, stones were put in place to deter wheeled vehicles from veering onto the sidewalks. Oleson describes these stones to have been places every three or five meters and used to also help individuals to mount animals. Knapton claims instead that stone walls called umbo were put in place rather than spaced stones. 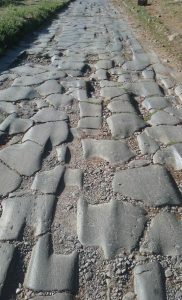 The Via Appia, built in 312 BC, is an example of Rome’s unique road systems. There is even one section of the Via Appia that stretches for 90 km in one straight line, accomplished by having surveyors take measurements at the highest points along this portion (Oleson, 2008). This road was one of the most influential roads in Rome, allowing citizens and troops to travel between the western and eastern shores of southern Italy. 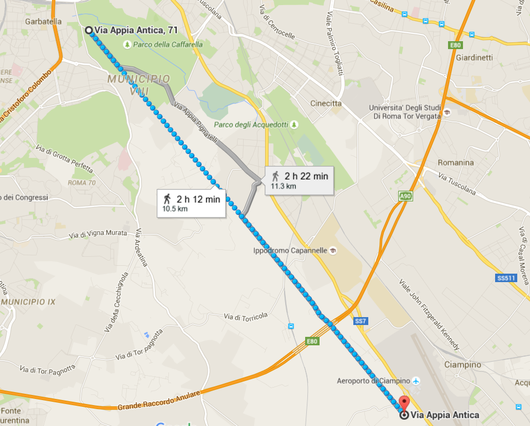 On August 29th, 2015 our group visited Appia Antica for a bike ride. We traveled approximately 10 km, as seen in figure 16, and only encountered one small bend in the road. Otherwise, despite our group being considerably stretched out, it was easy to look ahead or behind and see everyone. In fact, at almost all times did the road stretch out in front of us so perfectly straight that the edges of the road trailed away to the horizon towards its vanishing point. Since we completed our route within two hours and that involved traveling 10 km away from our bike rental and back, we traveled at least 10 km per hour (about 6 mph). This is a considerably lenient estimate since it doesn’t include picture stops and water breaks. Taking this into consideration, the Via Appia and roads like it would have been extremely simple to travel on and navigate when its original stone slabs were smooth and even. Roads especially allowed for a kind of flexibility that no other system could allow. As with all modes of transportation, there were its limitations; but the simplicity in which roads allowed movement opened up many possibilities. Even more so, the more thought put into the construction of roads, the more options there were to choose in how to move about. It has been argued by some engineers that wheeled vehicles likely didn’t use paved roadways due to any bumps in the surface causing damage to the vehicle and wagons being forced off the roadway in the case of coming across troops en route (White, 1984). Basing an evaluation off of these considerations alone, it would seem that carriages and wagons would have primarily been used on city streets rather than longer stretches of main roads. However, this his heavily disputed by the deep indentations found even on main roadways. We found such indentations in the original stone slabs during our visit of the Via Appia Antica, shown below. Knowing this we can proceed to evaluate how such vehicles did use the road network of Rome. This section focuses on evaluating the options Romans had particularly in regards to the movement of commerce and people. 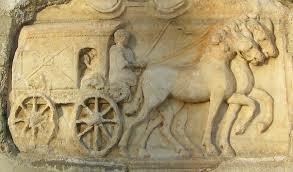 Commonly wagons, carts, pack animals, and even people were used to move goods between locations. Pack animals or human porters were the most regularly used. Particularly with human porters, their ability to travel along more difficult paths, interact with people, and move goods independently made them reliable and convenient. Human porters could easily navigate steep paths, narrow alleys, sharp turns, stairs, ladders, and so on. But the flexibility of man-powered transportation came with a price; porters could carry only up to 50 or 60 pounds over ‍very short distances‍. Beyond a few hundred yards, it became more logical to use a pack animal or cart to transport goods since they could carry a higher capacity over such a distance (Landels, 1978). In these cases, mules were largely used to transport cargo with “mule-drivers” to lead them. Mules, preferred over horses due to their thick skin, ability to travel over uneven ground, harder hooves, trainability, and need for little sleep, traveled a slow average of 3 mph but could cover around 50 miles a day (Oleson, 2008). Depending on their size and terrain they were crossing, mules could also hold anywhere between 90 to 120 kgs in pouches and sacks balanced across their backs (Landels, 1978). The wagon’s and animal yoking techniques the Roman’s used were simple and not particularly innovative or more advanced that those used by previous civilizations (Oleson, 2008), (Landels, 1978). Despite this, using such basic transportation techniques were fundamental to the Roman Empire; they were reliable, well tested, and could reach the distant corners of the empire that were out of reach of sea or river transport. This way the empire could take advantage of the conveniences of water transportation without needing to relying on it to the extent of limiting the empire. When wagons were necessary, there were two main options available. Lighter wagons, often made of ash wood, were pulled by horses or mules and were used largely for transporting passengers, seen in Figure 18; bigger wagons made of oak were made for heavier loads and pulled by oxen (DeSoto, 2012). This was largely due to the pulling capabilities of each type of animal. Where smaller and leaner animals could not produce as much forward power, they had more endurance over long distances. Whereas, oxen could exert almost up to 20,000 watts over 100 m and 300-400 watts for about six hours (Oleson, 2008). This made them ideal for pulling heavy loads. Horses and mules were saved for lighter baggage, longer trips, and more difficult to navigate paths. Typically, wagons were pulled by two animals, using a yoke and pole for harnesses. These harnesses were designed primarily for oxen where the yoke would would rest on back of the animal’s neck just above the small hump found on oxen or attached to the animal’s horns. Two straps were attached around the chest of and ox and behind the front legs to secure the yoke. The harness then attached to a point on the wagon lower than the yoke, allowing the yoke pushing on the hump of the oxen to take the majority of the wagon’s load. With this technique, oxen could apply a forward thrust of one and a half times as much as their weight using the yoke (Landels, 1978). 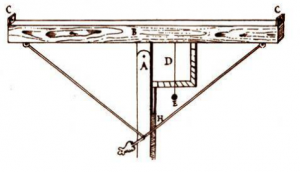 This allowed the animal to overcome the frictional and gravitational forces from slopes, roads, and wheels of the wagon. However, applying such a heavy load oxen typically moved at the crawling pace of approximately 1 mile an hour (about 2.5 km/h) (DeSoto, 2012). Similar harnesses were used for mules and horses, but only for lighter loads to avoid the potential of the front strap to press against the animal’s windpipe (Landels, 1978). 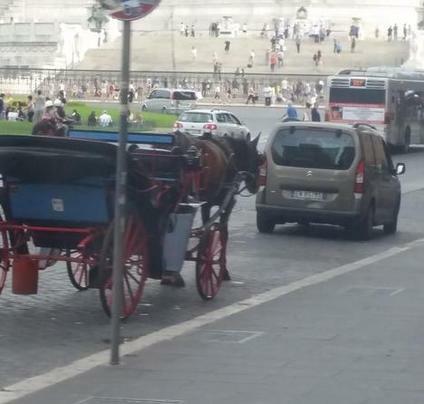 However this problem did not typically arise since animals were usually well within their load capacity with horses often pulling two wheeled chariots and mules pulling small carts. As for the wagons themselves, there was a surprising amount of variety. ‍Knapton (1996) ‍lists some of the most commonly used carts including: benna, a light cart; carpentum, two wheeled covered cart; carrus, a luxury chariot; rhedda, a four-wheeled mail cart; plaustrum, a two-wheeled farmers cart; and sarracum, a four-wheeled timber cart. One of the biggest differences between carts were the wheels, how many and of what type. 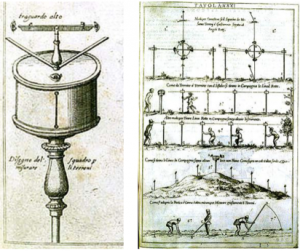 There were three types of wheels used: solid wheels made of gridded planks, a crossbar version, and a spoked type. The solid and spoked type of wheel were most commonly used, with the solid wheel used for the heaviest loads (Landels, 1978). With the solid wood wheel, there is more wood to take on the downward force of the wagon’s weight and it can do this uniformally. 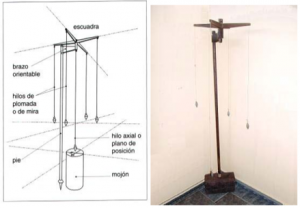 Whereas a crossbar or spoked type would not be able to hold as heavy of loads since the load bearing is redirected along the spokes and bars. These wheels can then be used on either a two wheeled carts or four wheeled wagons. Although the type of wheels used are clear, how they were mounted on the wagon’s are not as certain. Images make it difficult to determine the wheel’s turning abilities and mounting techniques. Some predict that wheels were either mounted on a “stub” axle with a pin to secure it or fixed to a rotating axle (Landels, 1978). If these were indeed the techniques used, it would make sense to use the “stub” ‍axle ‍for lighter vehicles that might need to make many turns; this type of axis could likely be combined with a bearing to allow the wheels to turn. The fixed rotating axel would more logically used for heavier loads and rougher roads since the wheels would not have opportunity to come loose or tilt on their mounts. The final difference between wagon’s was the box for carrying the load itself. This could be changed depending on what goods needed to be transported (Oleson, 2008). With each of these modes of transportation, although rudimentary, did show that the Romans understood the basics of forces, mechanics, and distribution. The Romans understood that a stronger animal was needed to overcome the frictional and gravitational forces of a heavier wagon. And the smoother the road built to pull the wagon over, the easier it was to move. But even further than that, the Romans understood the importance of balance. In the case of a weight being too heavy for one human porter to carry, four to six porters were used. 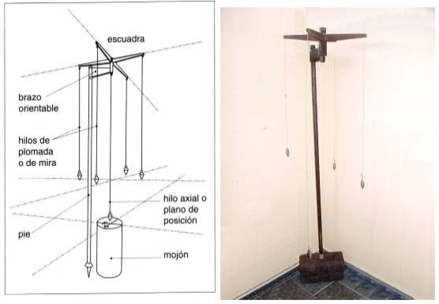 The load was then suspended between them and its weight distributed evenly to each porter with carrying poles (Oleson, 2008). For mules, although they could carry much more than a porter, this weight could not be put in a sack on one side of the animal. Instead it had to be divided evenly across the animal’s back. When it came to the heavier wagons, the yoke for oxen pulling the wagon could be adjusted such that the oxen would pull equally. And oxen were again used to pull two wheeled wagons instead of horses, which pulled chariots. This was to ensure that in the situation of the wagon tipping forwards or backwards, the animal pulling could handle any additional forces (Landels, 1978). 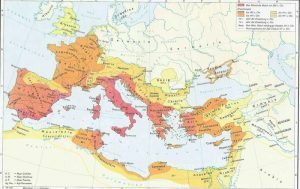 The road network that Rome created played a vital role in the development, expansion, and maintenance of the Roman Empire. Their widely varying functions supported the empire in commercial, communicative, and tactical ways. Even though many of the techniques used were not much more advanced that those used previously, the Romans applied this knowledge on a whole new scale and level of intricacy. 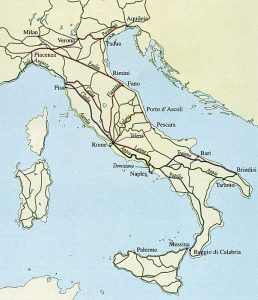 The resources available due to the empire constantly being at war allowed the Romans to develop methods of creating direct, efficient, and all weather road systems that had never before been seen in history; but continue to be influential in how modern road systems are built despite thousands of years of development. DeSoto, Paul. “Quantifying the Roman Transport System.” Spanish National Research Council, Merida, Spain. (2012): n. pag. Web. 12 Sept. 2015. Oleson, John Peter. The Oxford Handbook of Engineering and the Technology in the Classical World. New York: Oxford University Press, Inc., 2008. Print. Landels, J.G. Engineering in the Ancient World. Loss Angeles: University California Press, 1978. Print. White, K.D. Greek and Roman Technology. London: Thames and Hudson, Ltd., 1984. Print. Ong, Bryan. “The main roads of Ancient Rome.” 2013. Web. 20 Sept. 2015. Weingroff, Richard F. “Original Intent: Purpose of the Interstate System 1954-1956.” Highway History. Federal Highway Administration, 15 Oct. 2013. Web. 02 Nov. 2015. Originally published by ‘Engineering Rome‘ under a Creative Commons Attribution Share-Alike 3.0 license.